If there was a Mafia crime family of the virus world, it might be flaviviruses. Dengue, Zika, West Nile and yellow fever virus—to name the more notorious public health gangsters of this clan—are all mosquito-borne flaviviruses, and they're notoriously hard to take out. Researchers struggle to find drugs to combat just a single flavivirus at a time. Now, researchers at the Stanford University School of Medicine have discovered a way to block a handful of members of the family at once. The approach, rather than killing the viruses directly, is akin to cutting off a crime family's bank accounts: It revolves around inhibiting access to a complex of proteins in mammalian cells on which the viruses rely when they invade. 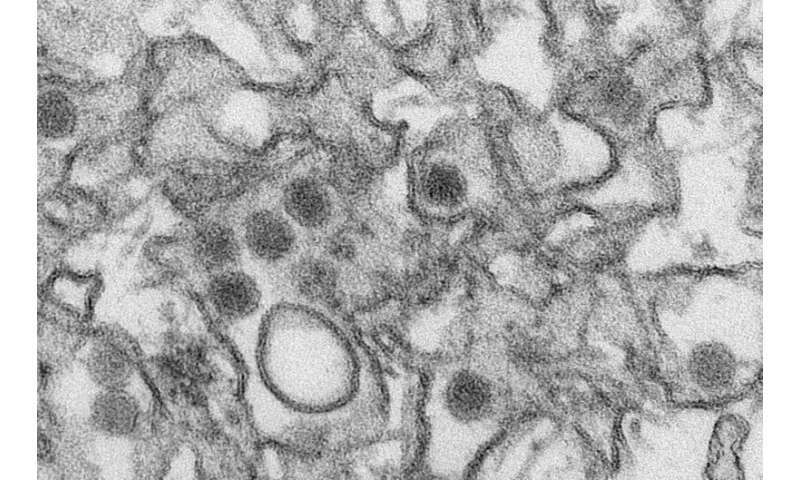 "Generally, when you develop a drug against a specific protein in dengue virus, for instance, it won't work for yellow fever or Zika, and you have to develop new antivirals for each," said Jan Carette, PhD, assistant professor of microbiology and immunology and senior author of the paper, which will be published Dec. 12 in Cell Reports. "Here, by targeting the host rather than a specific virus, we've been able to take out multiple viruses at once." Flaviviruses are single-stranded RNA viruses which, combined, are responsible for widespread morbidity and mortality throughout the world. Some flaviviruses, including dengue, Zika, West Nile and yellow fever virus, are spread by mosquitos, while others are spread by ticks. Existing drugs that work against flaviviruses often target parts of the viruses themselves. Carette and his colleagues, however, study the components of host cells—cells which viruses infect, such as human cells—that flaviviruses depend on. In a previous study, they found that the viruses are especially dependent on their hosts' oligosaccharyltransferase complex, which is normally responsible for adding sugar molecules, called glycans, to proteins. When Carette's team genetically engineered cells to lack OST, which is made up of multiple protein subunits, the cells could no longer be infected by flaviviruses. In the new work, Carette and lead author Andreas Puschnik, a former Stanford graduate student who now works at the Chan Zuckerberg Biohub, teamed up with Yale University researchers who had developed a drug, NGI-1, that blocked the activity of the OST complex. While high concentrations of NGI-1 stop the OST in human cells from carrying out its normal function, the group found that much lower concentrations of NGI-1 were needed to block flaviviruses from replicating inside the cells. Therefore, low concentrations of the drug could be used to block the viruses without harming host cells. When Carette and Puschnik treated Zika- or dengue-infected cells with NGI-1 immediately after infection, they saw a 99 percent decrease in infection; when the treatment was administered 24 hours after initial infection, the decrease was 80 percent. Additional experiments showed antiviral activity against all four dengue types and multiple strains of Zika, as well as against West Nile and yellow fever virus. The researchers went on to show it's unlikely that viruses will develop resistance to NGI-1 because it would require four specific and separate changes to their RNA. "When you target a host function rather than a viral protein, it's usually much more difficult for a virus to develop resistance," said Carette. To understand exactly what makes NGI-1 such an effective and broad antiviral drug, the researchers worked to determine which part of the OST complex was required for flaviviruses to replicate. When they inactivated the section of the complex that allows OST to add sugar to proteins, a process known as glycosylation, OST still enabled viral replication. "This means whatever OST is doing for the viruses is really unrelated," said Carette. "It also means we may be able to develop a drug that can more specifically inhibit the viral complex." While NGI-1 blocks both viral activity and protein glycosylation, the team is now working to uncover other compounds that will act more specifically against flaviviruses without impacting protein glycosylation at all. At the same time, they're continuing to study NGI-1, testing the drug in small animal models of dengue infection. "This work highlights how cell components can be used as antiviral drug targets," said Puschnik. "We hope this leads to a new generation of antiviral drugs."